On Saturday October 18, 2014, I was one of around 90,000 people who took part in “Britain Needs A Pay Rise,” a march and rally in London organised by the TUC (Trades Union Congress) to highlight the growing inequality in the UK, and to call for an increase in pay for those who are not in the top 10% of earners, who, it was recently revealed, now control 54.1% of the country’s wealth. 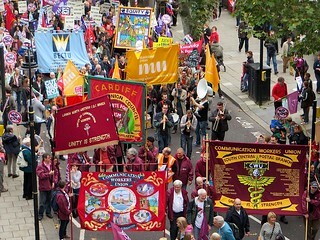 The London march began on Victoria Embankment and proceeded to Hyde Park, where there was a rally. Other protests took place in Glasgow and Belfast. After the longest and deepest pay squeeze in recorded history, it’s time to end the lock-out that has kept the vast majority from sharing in the economic recovery. The average worker is £50 a week worse off than in 2007 and five million earn less than the living wage. Meanwhile, top directors now earn 175 times more than the average worker. If politicians wonder why so many feel excluded from the democratic process, they should start with bread and butter living standards. An economy that finds money for tax cuts for the rich and boardroom greed, while the rest face a pay squeeze and big cuts to the welfare system — that any of us might need — is no longer working for the many. Here’s my latest article, linking to my first set of photos from the TUC-led march and rally in London, “Britain Needs A Pay Rise,” which was attended by 90,000 people from across the country. I had some great exchanges with people from Yorkshire and Lancashire, and I greatly enjoyed the sense of solidarity, something we’re not supposed to feel in the atomised, self-obsessed, materialistic world that has been mercilessly pushed for the last 30 years. Yes, Richard, revolution is needed everywhere that those who claim to lead us are interested only in leading us back to feudal times. Thanks, Dejanka. Good to hear from you! Good job! All those standing and marching for the people need to be applauded for their humanity and soul. Now on with the revolution. Good to hear from you, Jan. Yes, it was a good feeling of solidarity with so many unionised workers who understand solidarity. But for the revolution, of course, we need much, much more. The unions need to do more organising for events that are designed to appeal to everyone – those who are not working, those who are retired, and non-union workers, as well as those in unions. We are, to appropriate one of David Cameron’s great lies and to reapply it accurately, all in this together. Yes, 90,000 was good, Sanchez. I’m glad the numbers are impressive. But, you know, three and a half years ago, half a million marched against our vile government – and they’re still in power, and no less horrible, so it really should have been many, many more people. That said, it was a great day, and I’m thankful that so many people bothered to do something more important than shopping!